This word may make you uncomfortable. The basic concept of discipline has been interpreted, and enforced, in all kinds of harmful ways. However, practicing discipline is vital for living a good life, because being disciplined, broadly speaking, is about ordering our lives in a way that makes our activities as productive and beneficial as possible. Understood this way, discipline is really good! For Christians, practicing discipline should have a greater goal than increased productivity and personal benefit. The Christian idea of discipline is about shaping your life according to the heart, character, and will of God. This is something that God does in us, but our actions and choices also matter. After all, our faith is a relationship, not a one-sided contract. Christians have access to a catalogue of practices called the spiritual disciplines. You likely already use some of them, like prayer, reading the Bible, and journaling! Making use of them in your devotional time will help you grow closer to God. Discipline, in both the basic and Christian senses mentioned above, is necessary for you to thrive while studying at college. You’ll no longer have the clear structures and expectations you had living with your parents — you get to set them for yourself! This is exciting, but it can also get overwhelming. It’s a brave new world of responsibilities, including time management, study habits, new relationships, and self-care. Chances are one or more of these responsibilities will get neglected, and the area most at risk is your spiritual life. If you are attending a Christian school, it means you aren’t alone in your faith, but you can’t expect your community to shape you into a Christ-follower by osmosis. A Christ-centered community will challenge you and help you to grow in all areas of your life, but no one will make you go to church, no one will make you attend a small group, serve, or pray, and read your Bible. At some point, you have to commit to these things! If you want to grow in faith during your studies, practicing discipline will be necessary. But what does that actually look like? The Church has a series of devotional practices that have been around for centuries. In essence, they are that help draw us closer to God, enriching our lives with more of his goodness and life. I’m not speaking from a vacuum here. I went to a Christian college that had a rich community, with many opportunities for academic and spiritual growth, mentorship, and service. However, in many ways I coasted through my studies and communal life — my time was often consumed by Netflix, video games, and unhealthy relationships, to name a few. My time could have been devoted to healthy practices that would have led to a closer connection to God, enriched friendships, and academic excellence. I regret these choices. However, I have learned valuable lessons from them. While I was in college, I remember listening to a sermon by John Piper with my one of friends. Piper was preaching from Mark 9, the passage where Jesus offers an uncompromising stance on habitual sin. He commands, “if your hand causes you to sin, cut if off. It is better for you to enter life crippled than with two hands to go to hell, to the unquenchable fire”. Piper used this passage to draw out an important principle for our spiritual lives: no matter the personal cost, even if it maims you physically (hopefully it doesn’t come to that), you must be vigilant in ridding your life of sin. We simply have to do this in order to pursue a life with God that is holy and blameless. Allowing any opportunity for sin to remain is far more costly. I had some biases against Piper, and I thought I knew better. I chose to reject this lesson, thinking that he lacked compassion and grace for people trapped in habitual sin. I didn’t see that he was speaking the words of Jesus. My heart was hard. Ignoring this principle made it more difficult to spend time with God, and it hurt me more deeply than letting go of my pride would have. My health, my grades, and my relationships all suffered as a result. I’m not telling you this because I think it will happen to you! The point is that your proximity to God will affect the moral and spiritual quality of your life. The etymological root of ‘discipline’ means to instruct, educate, or train. In other words, to be disciplined means to train yourself to think and live in a way that leads you toward your goals. This definition changes when applied to Christianity: you are not seeking to instruct yourself for the sake of your own improvement. Rather, the goal is to be be formed into Christ likeness, to be present with Christ. Discipline, in this sense, is for strengthening your relationship with God. Any habit in your life which has this as its underlying goal can be considered a spiritual discipline. Spiritual disciplines are as much about giving yourself limits as they are about positive practices. And setting limits for yourself is truly one of the best thing you could do. Living faithfully according to God’s commands frees you, yielding joy and fullness of life. The discipline of cutting out the vain things in our lives and implementing the worthwhile things is the path to finding our fulfillment in Jesus. The Church is built on spiritual disciplines, centuries-old traditions of prayer and contemplation of the Bible designed to help followers of Christ grow closer to God and live faithfully in the world. 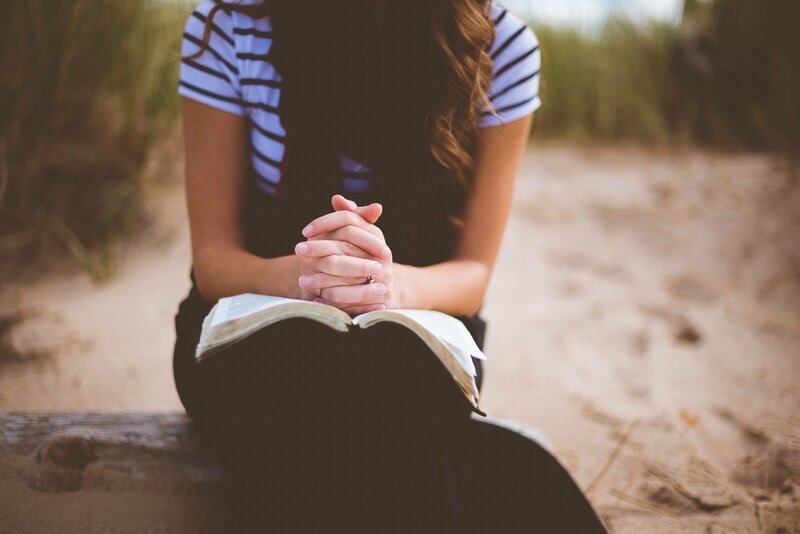 These practices are rich resources for the student who wants to continue to grow in their relationship with Christ throughout their college experience. The following list includes disciplines that I’ve found very helpful. This is the simplest and most important of all the disciplines, and often the hardest to do. Paul encouraged Christians in Thessalonica to “Pray without ceasing.” How can we do this? To start, try going on at least one prayer walk each day. End the day with journaling your prayers. Pray with fellow students whenever you are stressed out. Ask your professors or other mentors to pray for you. These are just some ideas to get you started. And if you find your prayer life is lacking, the best thing to do is ask God to give you a praying spirit! This is a meditative form of prayer to help you recognize God’s presence with you throughout the day. To begin, pick a word or short phrase to become your “prayer word”. Focus your attention on this word or phrase, and breathe deeply in and out. When your mind wanders (and it will), don’t beat yourself up. Notice where it went, then gently bring it back to your prayer word or phrase. This is not about searching for a special encounter with God, but centering yourself on the truth of who God is and who you are in him. This exercise of focus should take only 5 to 20 minutes out of your day. Keeping a gratitude journal might sound cheesy to you, and that’s fine. Practicing gratitude goes a long way in changing your overall mindset and heart posture. Each day, write down ten things that you are grateful to God for. They can be anything, big or small. Doing this regularly will make thankfulness an intuitive way of thinking, and at the same time lift you out of despair or self-pity. Thanking God is always a great way to get rolling as you approach God in pray (check out Psalm 100:4). Translated, Lectio Divina means divine reading. This practice is designed to focus your mind on passages of Scripture, going through them line by line, so you can better recognize the voice of God. This is about enjoying being in God’s presence and hearing what He has to say. No reading program, no deadlines. Often we treat Bible reading as something to check off, we rush through it and we miss the fact that God, through the Holy Spirit, actually wants to speak to us! But in order to hear that still small voice, we need to slow ourselves down and give the Word the attention it deserves. Look for good, rigorous theology rather than the secularized forms of Christian thought that often find their way into mainstream Christian culture. Make a habit of reading a few of these books per year, and increase it if you feel like you can handle more. I recommend A.W. Tozer’s The Pursuit of God or Dietrich Bonhoeffer’s The Cost of Discipleship if you want a real challenge. This is not a bona fide spiritual discipline, but it is a good practice to keep. For a meaty devotional, check out Charles Spurgeon’s Morning & Evening. These are but some of the spiritual disciplines that you can introduce into your life. Keeping a sabbath day as well as scripture memorization are also very helpful. But don’t be discouraged if you start and fail to stay consistent — just pick them back up. Any time spent engaged in these practices will prove fruitful! If you want to learn more, Adele Calhoun’s Spiritual Disciplines Handbook is a great resource. Spiritual disciplines will not magically solve sin, doubts, anxieties, or challenges that you are facing. If you’re looking for a silver bullet, you will be let down. These disciplines will only “work” if they become a regular routine and habit. While they are an act of worship towards God, these practices won’t automatically produce spiritual feelings. They will, however, slowly align your heart and mind with Jesus. In the words of the late Eugene Peterson, “If Christians worshiped only when they felt like it, there would be precious little worship… worship is an act that develops feelings for God, not a feeling for God that is expressed in an act of worship. When we obey the command to praise God in worship, our deep essential need to be in relationship with God is nurtured.” Essentially, following God is not a passive thing. The point of the disciplines is to nurture the innate desires of our hearts to be in relationship with God. Obedience and holiness are the fruits of a close relationship with God. Getting a degree is good, but being formed into Christ likeness is a far better reward and should be the ultimate goal of your Christian education. You may say, “I simply don’t have the time for any of this during the school year”, but what you’ll find is that your hours go a lot further when God is given the priority. Your anxieties will lessen and your productivity will increase. God will become more real, more desirable, and more evident to you in the world. So, start exploring the spiritual disciplines now, and find what unique expressions of them best suit you. The author of Hebrews emphasized that “No discipline seems pleasant at the time, but painful. Later on, however, it produces a harvest of righteousness and peace for those who have been trained by it. Therefore, strengthen your feeble arms and weak knees.” God is pursuing us. As we choose to draw near to God through practicing discipline, so too will He draw closer to us. He wants us to grow strong and resilient when we encounter struggles. He wants us to enjoy the fruits of a righteous life. So, open yourself up to God’s guidance and the grace you need to live this life well. The result will be lasting joy and life to the fullest.